Located in Bayard, Delaware just minutes from the Atlantic Ocean. This huge refuge is a host to many migratory birds, with many side areas to explore along the inland bay areas. This is my favorite place to watch a nesting pair of American Bald Eagles who are yearly visitors. Along with the migratory birds, you will find many of our local species of waterfowl, shorebirds and songbirds. Bring a picnic lunch and enjoy the day. An observation tower and photo blind are available along separate bay areas. Located at the Indian River Inlet, just follow the signs. This is a mile trail thru wetlands and woods. Don't forget your bug spray, but is well worth the venture. Located at the tip of Lewes, Delaware this location is just across the Delaware Bay from the infamous Cape May, New Jersey birding Hotspot. Many walking and biking trails to explore the beach and woodland areas. Located in Clarksville, Delaware 5 miles inland on the Indian River. This walking trail hosts many migratory birds and local favorites. A playground, pavillion and boat launch are available. Peaceful setting. Home to the famous Chincoteague ponies, this park is a combination of American history and new fond memories. Everything you need is here. Many different trails and beaches to explore and captivate you. The nature center located at the entrance has a wealth of information and camping facilities are available. Say hi to MISTY ! Book a 4 hour scenic cruise or dolphin watch with local Capt. Rick Speigel. 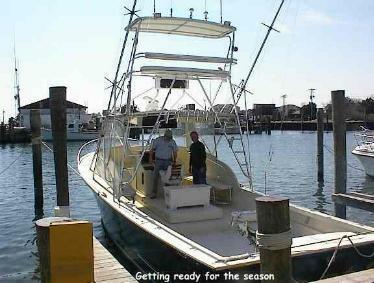 Visit his site at www.lastdollarcharters.com Located at Sunset Marina in West Ocean City, Maryland.